Now stories about Krishna's deeds spread far and wide. When Kamsa heard about Krishna, he was sure that Krishna was Devaki's eight born child, born to destroy him. He, in turn, planned to invite Krishna to Mathura and have him killed. He summoned an old minister by the name of Akrura and sent him to Gokul with an invitation. Now Akrura was wise. He knew the real story of Krishna. That Krishna was a divine being born to kill Kamsa. He also knew that Nanda and Yashoda were not really Krishna's parents. On arriving in Gokul, Akrura told Krishna and his parents everything. Nanda and Yashoda were horrified, they wondered how a teenager like Krishna could take on a warrior like Kamsa. 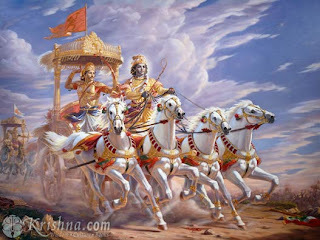 But Krishna insisted on going and he and Balrama left for Mathura. In the mean time, back in Mathura, Kamsa was thinking of ways of having Krishna killed. He asked an elephant trainer to have a mad elephant trample Krishna. Failing that he was sure that his best wrestlers Mushtika & Chanura could challenge Krishna & Balrama to a match and kill them. When Krishna arrived in Mathura, the elephant trainer was waiting for him at the gate. He sent the mad elephant Krishna's way. Krishna picked up the elephant by its trunk, hurled it into the air and killed it. Krishna and Balrama then made way for the wrestling arena where Kamsa was. Kamsa then told Krishna and Balrama that his foremost wrestlers Mushtika and Chanura had heard of their strength and valor and would like to challenge them. Balrama killed Mushtika in mortal combat and then Krishna fought and killed Chanura. Krishna then rushed towards Kamsa, grabbed his sword and killed him. Krishna then lifted the crown from Kamsa's severed head and walked towards the dungeon where King Ugrasena was imprisoned, freed him and offered him the crown. King Ugrasena was touched that Krishna would make him King again. 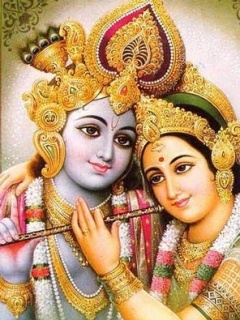 Krishna then freed his parents Devaki and Vasudeva and had a joyous re-union with them.